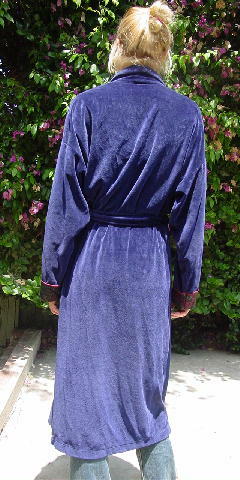 This vintage dark blue velour robe is 80% cotton and 30% polyester, was made in the USA, and is a Christian Dior Monsieur. 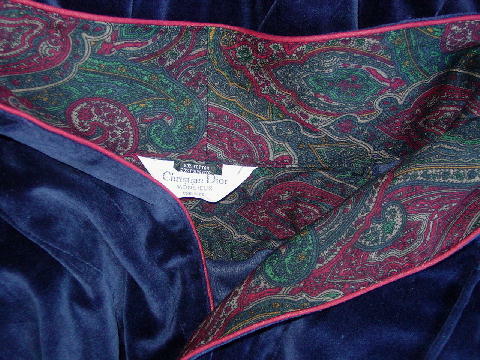 It has a dark red, blue, green, maize, and grayed-taupe paisley trim on the cuffs, collar, and a 2 3/4" wide interior trim on both front sides. It has a double sided fabric matching tie belt, 2 sets of belt loops, and there are 2 open front lower pockets and 1 breast pocket. The breast pocket and front sides and collar have a red cord trim. 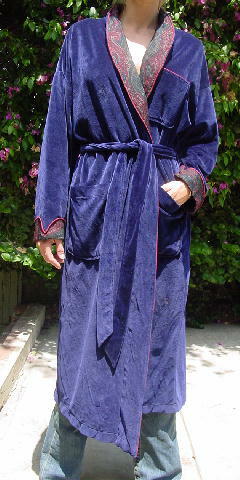 It's from a stylist's inventory, and was worn in several movies. shoulder to shoulder 27 1/4"
shoulder to end of sleeve 20 1/2"